Provides a collection of templates to author preregistration documents for scientific studies in PDF format. prereg provides R Markdown templates that facilitates authoring preregistrations of scientific studies in PDF format. 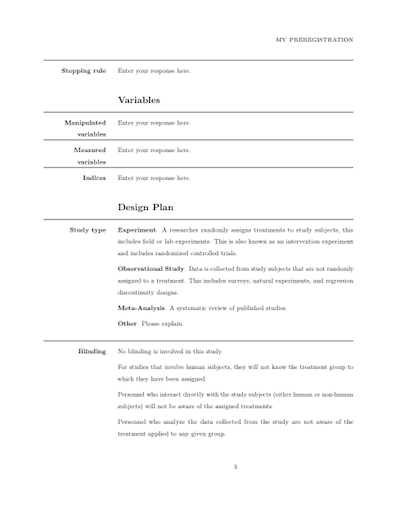 The templates are based on the Center for Open Science Preregistration Challenge, the AsPredicted.org questions, a template suggested for social psychology by van 't Veer and Giner-Sorolla (2016), and the replication recipe suggested by Brandt et al. (2013). If you experience any problems or have suggestions for improvements, please open an issue. If you are running Windows, use MikTex if possible. Currently, pandoc and the Windows version of Tex Live don't seem to like each other. Make sure you install the complete---not the basic---version. or the development version from this GitHub repository (you may have to install the devtools package first). 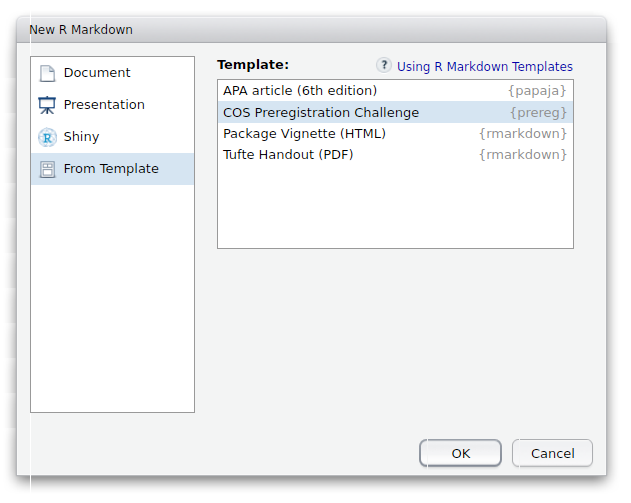 Once you have installed the prereg you can select the templates when creating a new R Markdown file through the RStudio menus. prereg produces a clean form-like document. The template file contains comments that provide further details on how to fill in the form but are invisible in the final PDF document. 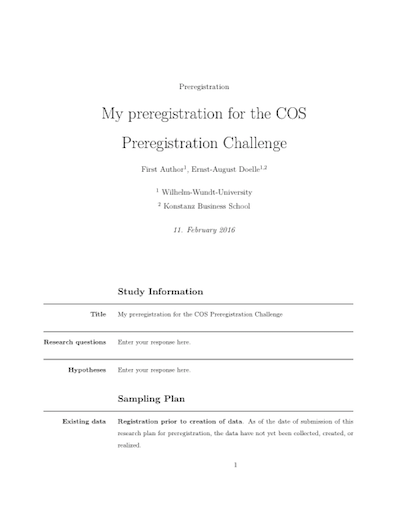 The templates for the preregistrations were developed by the Center for Open Science, AsPredicted.org, and Anna Elisabeth van 't Veer and Roger Giner-Sorolla, respectively. I'm thankful for their permission to use their material in this package. New template based on van 't Veer and Giner-Sorolla (2016). See ?vantveer_prereg.